You may be familiar with one of our other add-ins, Auto Print Pro. Auto Print Pro allows you to print some emails to this printer, and some emails to that printer, based on the subject, who it’s from, etc. Save As PDF Pro recently underwent this same conversion. Now it can save emails and/or attachments as a PDF, or to a PDF Portfolio, or to a new format, a single monolithic PDF file. Like Auto Print Pro, rules can be setup so that it converts to PDF if from a certain sender, if the email has a certain subject, etc. You can have as many rules as is necessary for your archiving needs, and each rule can save to the same or a different PDF file. If saving to a PDF Portfolio file, or to the new single, monolithic PDF file format, and that file already exists, it will automatically append it to the end. You might be wondering what the difference is between a PDF Portfolio and the new monolithic file format. A PDF Portfolio is a structured format that PDF readers must be equipped to support. Newer versions of Adobe Acrobat, Adobe Reader and others support reading PDF Portfolios. Finally, with a PDF Portfolio file, any file format (like a Word document or Excel spreadsheet) can be inserted into it and it will still be displayed using a convenient tile view. Conversely, the monolithic format is just that – it’s a series of (in this case) email 1, attachment 1, email 2, attachment 2, etc. While it is not limited to size constraints it may be unwieldy if you allow it to grow beyond the abilities of your PDF reader. With the add-in, we still bookmark each email and attachment for easy navigation but there is no tile display showing an image of the email and/or attachment. However, this new format is supported by all readers, because after all, it’s just a single large PDF file. We implemented this feature by user request. In addition, Save As PDF Pro still puts up two toolbar buttons for converting individual emails to PDF. One of the buttons is designed to allow you to select whichever emails you need converted to PDF and the other is for also selecting your necessary emails but then converting to a PDF Portfolio. But with this release, you can now override the default behavior of either button so if you want to save using the new single large PDF file format, or have the add-in always ask you which PDF file it should use, or whatever you need, either button can be customized to work they way you need it to. The two big buttons allow saving Windows files to PDF. The smaller buttons control what the larger buttons do. One is for converting any Windows files into PDF, and then appending them all into a single large PDF file, one right after the other. The other button was actually present in the earlier version, it allows you to also select and add any Windows files to your chosen PDF Portfolio file. Similar to the new Outlook toolbar buttons, you can now edit the “rule” that governs these buttons to customize what happens after you click them. We labeled this version 6.1 and it is currently in beta. If you’ve purchased Save As PDF Pro within the last two years you can upgrade to this new version for free either now, or when it is out of beta (about a month). Of course, you can try out this version by simply downloading a free, two week trial version. 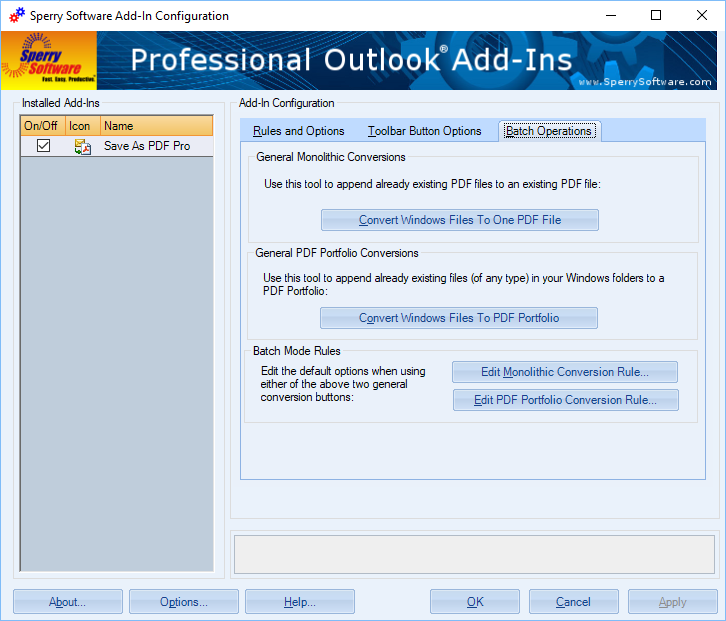 Message Outlook 2016, Outlook rules, Save As PDF, Save As PDF Pro. permalink.